I exhibited Children’s book illustration, puzzles, posters and book’s in progress made over the period of 20 years. During the exhibition I will be running a workshop in illustration for kids 7-13 years old. The RWA’s Annual Open Exhibition – now in its 163rd year – is a highlight of the region’s art calendar. Attracting leading artists from throughout the UK, it is open to all, and often includes work by previously un-shown exhibitors alongside well-known names. A selection panel assesses every entry and this year 593 works by 386 artists have made it into the final exhibition. The exhibition also includes a major work by this year’s invited artist, Rose Hilton, who is the RWA’s latest Honorary Academician. My linocut print ‘Rocking’ was hanged in a black and white room in a prominent place! The Clifton Arts Club annual open exhibition is a show case for artists and is held at the Bristol School of Art annually in July and attracts many professional artist throughout the South West. 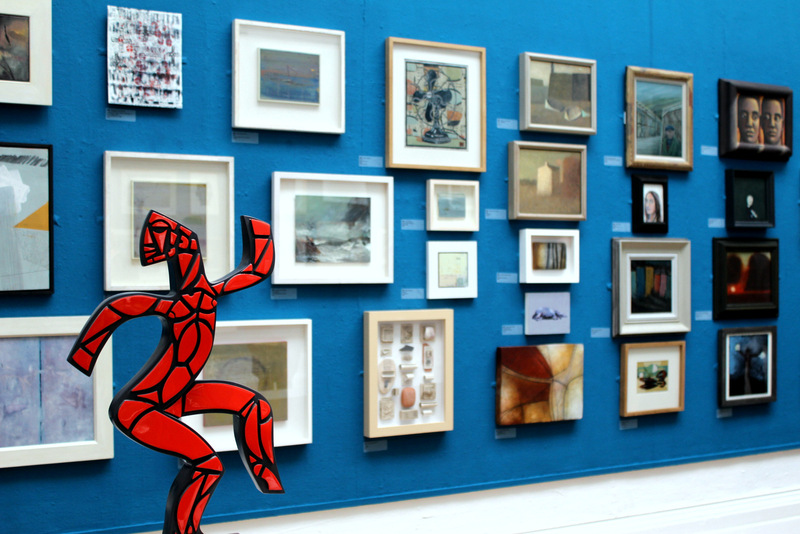 Selection is done by RWA academicians and we have a very large entry – hanging approximately 350 paintings and prints, as well as sculpture, ceramics and 3D work. Many of our members have been accepted by the Bath Society and the Royal West of England Academy events. all together, instead being scattered around. But I’m happy because they are on display! Please go to see the exhibition admission free! At the Royal West of England Academy gift shop I have five prints in linocut for sale! I had a dilemma about a title for this print. At first it was ‘Light’ but then I’ve changed it to ‘Good Vibrations’. Anyway, actually it resemblance to some live, electrical entrance into another world and maybe I should have called it something like that! This print, as all the rest of my linocut prints, has a texture, emboss, which unfortunately cannot be captured on a photograph. Many people like this print because it’s a very simple image beaming with electrical energy!